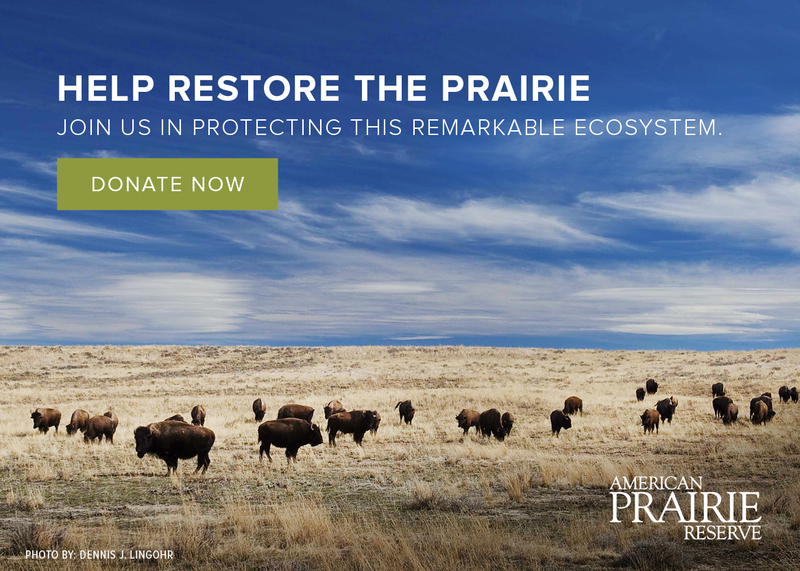 American Prairie Reserve is located on the legendary high plains surrounding the Missouri River in northeastern Montana. View a full-screen interactive map. Visit the Maps page for property-specific maps and for instructions on using Avenza while on the Reserve. Planes, trains and automobiles can all get you to Montana, but you’ll need a personal 4WD vehicle to access the Reserve. No matter how you get to the Reserve, you'll want to consider weather, safety, and where you can get fuel and supplies. There is commercial air travel into Billings (BIL), Bozeman (BZN), and Great Falls (GTF). Your drive time from the airport to the Reserve depends on the airport and region of the Reserve you will visit. In general, it takes 4 hours to drive from Billings and Great Falls and 5.5 hours to drive from Bozeman to the heart of the Reserve and Buffalo Camp. Amtrak stops are located in Malta and Glasgow, but vehicle rental services are limited to Glasgow at this time. Neither stop has ticketing services so arrange for travel in advance. In addition to the drive times from Montana cities listed above, driving to the Reserve typically takes 1 hour from Malta, 3 hours from Lewistown, and 8 hours from Missoula. Most visitors access the Reserve from the south through Lewistown or from the north through Malta. We continue to improve signage to help visitors navigate this remote region. For safety reasons, use your odometer to track mileage and use the directions below to access the main Sun Prairie unit, where all of our visitor facilities are located. Please review the Safety Considerations for more information about driving on the Reserve and don’t forget to request your APR Visitor Map, which also includes the driving directions below. Head south out of Malta on Central Ave.
After crossing the canal and passing 12th Street, turn left onto Highway 364 (It is unmarked. If you pass Joe’s In & Out on your right, you have gone too far. In 3.8 miles the road will turn to gravel. In less than 0.1 of a mile you will come to a fork in the road. Bear right at the Y in the road to take Regina Road. Continue for 29.7 miles to a T-intersection. Turn left. In one mile you will pass First Creek Hall and a waste transfer station on your left. Continue for 5.5 miles until you reach a T-intersection. To your left will be a road to the Sun Prairie North unit. Turn right. Follow signs for American Prairie Reserve’s Buffalo Camp. The Enrico Education and Science Center is about a mile past the campground. Travel north on Highway 191 out of Lewistown. After approximately 40 miles the road will reach a T-intersection at “Bohemian Corner.” (There will be a gas station on your left). Turn left. Follow Highway 191 north through the Charles M. Russell National Wildlife Refuge. Roughly 21 miles after crossing the Missouri River you will come to DY Junction (at mile marker 109), which you will know by signs on your left to the town of Zortman. Turn right onto gravel road. The road will immediately fork past a sign exhibit. Bear left onto Dry Fork Road. Follow Dry Fork Road for 26 miles to a T-intersection (there will be several trailers and a white building in front of you). Turn left. After 3.5 miles the road forks. Bear right. Continue for 12.7 miles to the next T-intersection.